Coagulation begins almost instantly after an injury to the blood vessel has damaged the endothelium lining the blood vessel. Exposure of blood to the subendothelial space initiates two processes: changes in platelets, and the exposure of subendothelial tissue factor to plasma Factor VII, which ultimately leads to fibrin formation. Platelets immediately form a plug at the site of injury; this is called primary hemostasis. 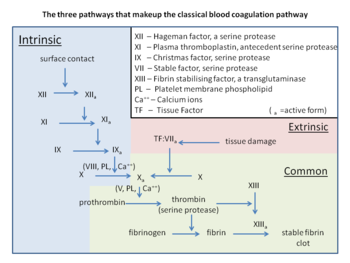 Secondary hemostasis occurs simultaneously: Additional coagulation factors or clotting factors beyond Factor VII (listed below) respond in a complex cascade to form fibrin strands, which strengthen the platelet plug. Activated platelets will release the contents of stored granules into the blood plasma. The granules include ADP, serotonin, platelet-activating factor (PAF), vWF, platelet factor 4, and thromboxane A2 (TXA2), which, in turn, activate additional platelets. The granules' contents activate a Gq-linked protein receptor cascade, resulting in increased calcium concentration in the platelets' cytosol. The calcium activates protein kinase C, which, in turn, activates phospholipase A2 (PLA2). PLA2 then modifies the integrin membrane glycoprotein IIb/IIIa, increasing its affinity to bind fibrinogen. 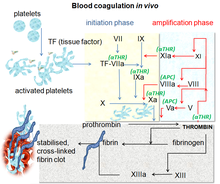 The activated platelets change shape from spherical to stellate, and the fibrinogen cross-links with glycoprotein IIb/IIIa aid in aggregation of adjacent platelets (completing primary hemostasis).